First of all, let’s be clear…I am not normally one for country music and its oft-demonstrated blandness and similarity in delivery and subject matter…but non-lovers of some blues or rock music could, justifiably, level similar criticisms. So when this fell into my iTunes, I was a little apprehensive but I gave it a number of objective listens, and left my biases behind. What became immediately obvious is that this is not a standard country album by mine, or any other’s measure. 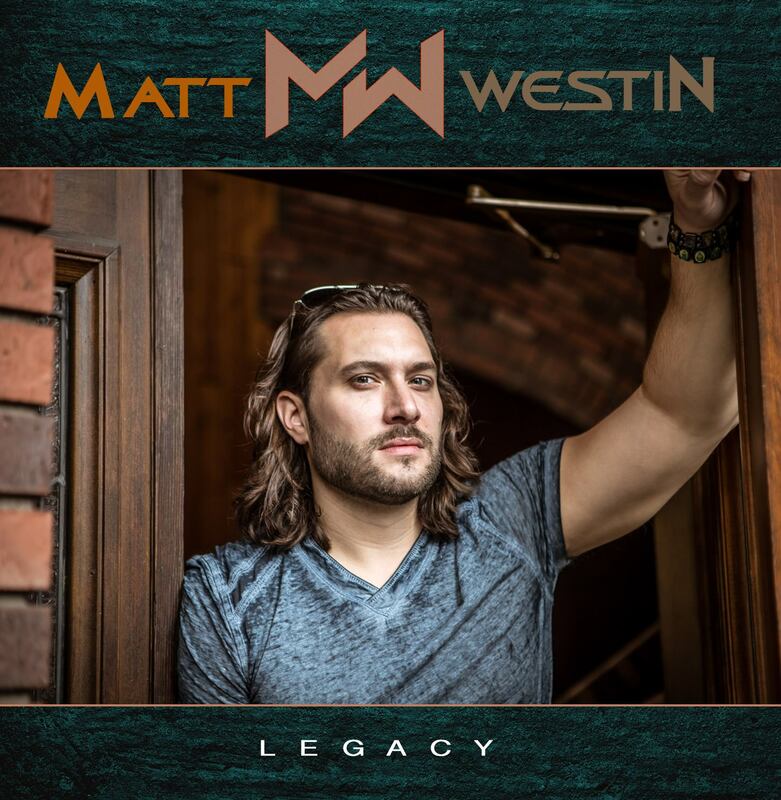 Matt Westin has created with his debut album, Legacy, an exploration of his recent emotional turmoil, set to a musical palette of varied compositions. Yes, there is a country feel to some, but mixed in is a healthy dose of rock, pop and blues to lift beyond the standard fare. Matt Westin was born and raised in Pittsburgh. He walked away from a career in engineering to pursue his passion for music. For over ten years he performed in the bars and clubs of his hometown then, following the tragic loss of his father to Leukaemia in 2016, he decided the time had come to put his skills on record and honour his father’s memory and support. The stars aligned when he was introduced by a mutual friend, to musician/songwriter/producer Bryan Cole, and together they set about creating Matts’ vision. Opening track, You Leave Me No Choice, is more soft-rock ballad than country even with the lap steel and banjo in the background. The electric guitar riff and chorus is closer to Bon Jovi than Garth Brooks. Things do go very country on Don’t Feel the Rain with a delicate acoustic guitar and a voice pitched like many of that ilk and is the weakest one here. Good Time with a great bass and banjo is Brothers Osborne toned down as “all he needs is a few good buddies and a beer” sums the song up quite neatly. Our Redneck of the Woods is the best of the bunch and is pure southern rock with a heavy riff and slide guitar (oh, and a banjo!). Although I don’t know what snap beans are, the lyrics are very clever and are worth paying close attention to, even as a non-American. Right Amount of Wrong is back down the country lane, but the backing is always rewarding with more clever lyrics to decipher. The next track takes us back into rock territory with a slide and riff to enjoy. Too Many Mondays is another Bros. Osborne style of, what I can only call ‘heavy country rock’. The Devils Door is again a great riff with lap steel behind it and a really very good if too short, guitar solo. Acoustic and lap steel herald The Road That Never Was which, after the last track, slows the pace and, when the electric cuts in, we are back into power country ballad land…lighters out everyone. Another quality guitar solo takes us to the fade. Next up, get your cowboy boots on for an electrified session of line-dancing…yes, really. This is a southern rock line dancing song, albeit one that would have you knackered very quickly…and I never thought I would ever type that sentence! Final track, Southerly, starts off with a lovely gospel over classic organ, and then acoustic and banjo join in a celebration of heading home. This is another hybrid as we get a quite enjoyable piece of gospel country blues or country gospel blues, depending on your viewpoint. If I must, I will use the cliché beloved of the music industry…Matt Westin has produced a ‘crossover’ album. That industry says this is a country album, I say it is a country-rock album with plenty to enjoy, even if it won’t be sought out every day. The true country song, Don’t Feel The Rain is the only one to skip, but that is purely personal. Equally, Or Redneck is one I will seek out. Give it a listen because one thing is certain, it will surprise you in a positive way and it should be filed alongside the aforementioned Brothers, Cadillac Three and their peers. Apologies for not listing all of the instruments and/or musicians; the information was very hard to come by and I have included those I found.